What is the Shine All The Time Club? 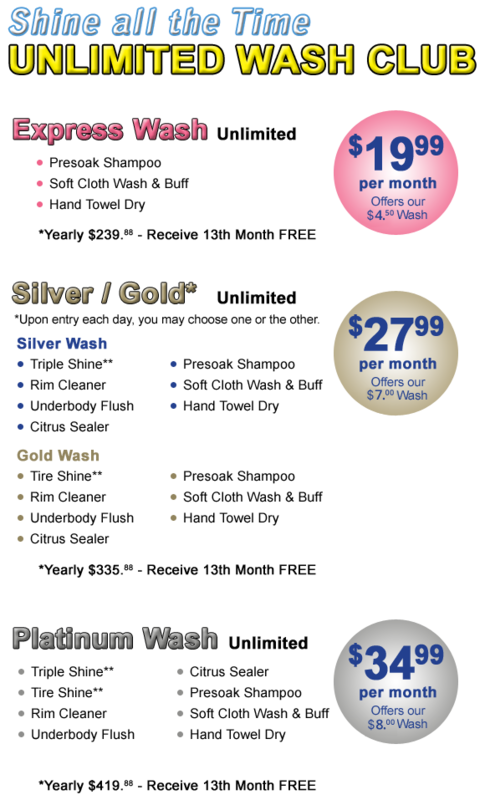 If you become a member, you will receive unlimited car washes, varying by the type of package you choose. Members pay by credit or debit card automatically every month, or yearly depending on which option you choose. You can always cancel 5 days prior to your next billing date. All information will be kept on a SECURE server. You will be able to access your club account here. Members sign up and receive a Club Card. Simply drive up and show us your Club Card. Our friendly staff will quickly scan your card, and you will receive your wash. No extra wait, wash as many times per month as you’d like. What a deal!! Your Club Card will be tied to your specific car. The program is tied to one car and limited to unlimited washing for that car only. If you wish to switch your information upon purchase of a new vehicle, or other, please do so by calling us at 248-549-6770, or by emailing us at [email protected]. The monthly fee for Unlimited Washing will be charged to the customer’s Visa, Master Card, American Express, Discover Card, or Debit Card on the first of every month. If initial monthly charge occurs after the first of the month the amount charged will be prorated from the date of activation thru the end of the month. In the event the customer wishes to cancel the program, cancellation must be received no later than the 5 days prior to the billing date on the 1st of the month. 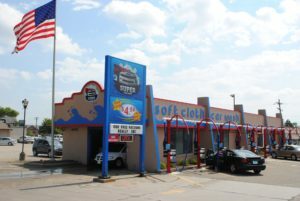 Notice can be given by calling our Main Office at 248-549-6770 or through our Website at www.supercarwash.net. There are no partial month refunds. In the event Super Car Wash is unable to charge a customer’s credit card due to card expiration, or a change in information, the customer’s program will be deactivated immediately. Super Car Wash will attempt to notify customer immediately should an issue arise. Customers card is valid on one specific vehicle only, abuse of this policy will result in loss of membership, with no refund. The listed vehicle can be changed no more than twice per calendar year. A valid email address is required for signup. Customer should notify Super car Wash if registered vehicle’s card becomes damaged, is lost, or stolen. Customer card will be deactivated and a new card will be issued. Card will reflect new customer number. Super Car Wash reserves the right to change the price or other terms of the Shine All The Time Club, but Super Car Wash will notify customer at least 30 days prior to any changes.